Please call us or text us for an appointment – At your location – we come to you! 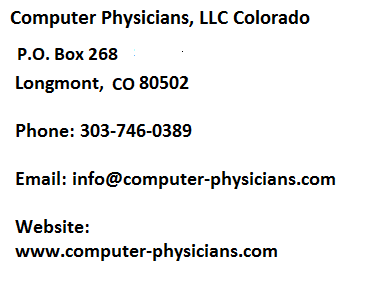 Computer Repair PC service virus removal, data recovery in Longmont, Boulder, Erie, Denver, CO at your location – we come to you! Networking – managing users, groups, sharing, permissions, printers and troubleshooting the network. stand alone PC’s and workstations. 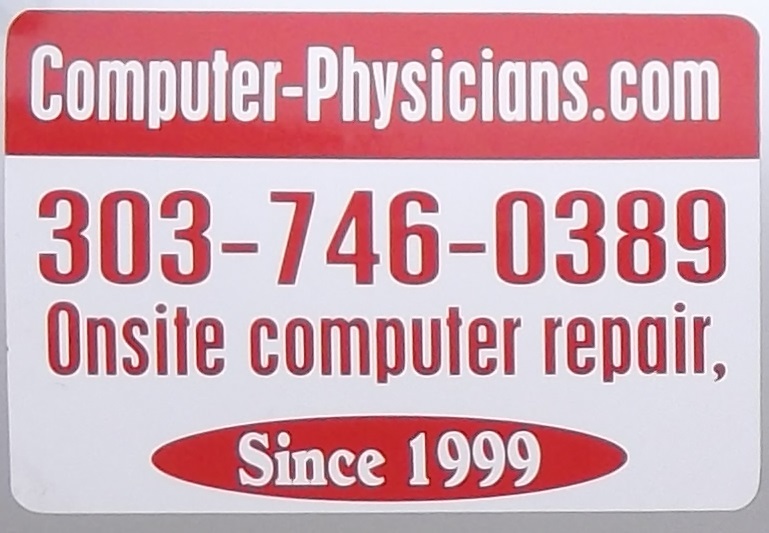 Computer Physicians are Data Recovery and Crash experts. We have worked with thousands of satisfied customers since 1999. We can also teach you how to use your computer, email, programs, devices, websites, smart phones, tablets, etc. Onsite at your location or in our work shop, or remote computer service. In many cases, we can repair your computer the same day you call us. We also provide remote computer help through the internet or we can come to you so you never have to leave your office. For a reduced rate and quick turn-over time you can visit us at our workshop in Longmont close to 19th and Main. This is about 7 miles from downtown Boulder Colorado. You will need to call us first to let us know what time you will be coming to drop it off, and to get directions. By appointment only. Servicing onsite at your location in Boulder, Longmont, Erie, Denver and the Colorado Front Range and worldwide via remote access.